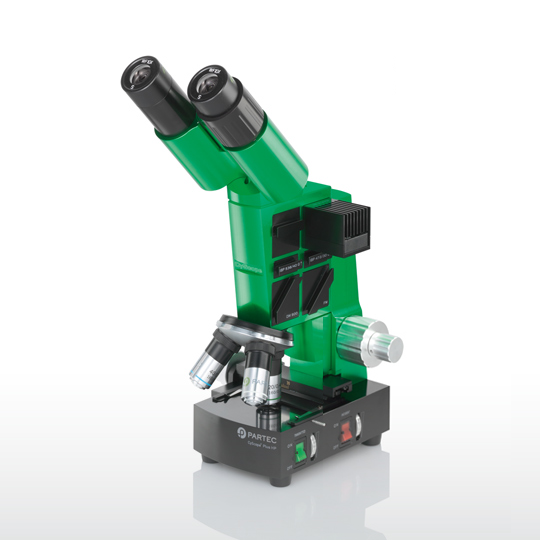 The CyScope® HP is a uniquely innovative microscope, offering LED fluorescence and light microscopy in a compact design and implementing sophisticated optics. It employs incident light (e.g. UV, royal blue, blue, green, red) and transmitted light detection, either simultaneously or separately. The blue (470nm), green (528nm) and red (624nm) LEDs with extremely long lifetime of several thousand hours work in a high power / high current mode, cooled by a miniature fan. As well as being a laboratory microscope, the CyScope® HP can be operated using a battery, allowing true portability for field work. Additional microscope variations available upon request. Additional experimental setups can be added at any distance from output aperture.